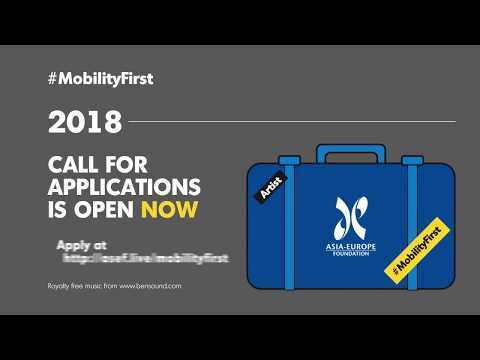 The 2018 Mobility First! Call for Applications is now closed. The 2019 call will be launched in early-January 2019. In this context, ASEF's Mobility First! travel fund has been acknowledged, in its 1st year, as a "success story" by a multilateral intergovernmental organisation to bridge existing gaps in support for artists' mobility. ASEF's Mobility First! is funded by 51 Asian and European countries, the European Union and the ASEAN Secretariat in the framework of the Asia Europe meeting (ASEM). The Asia-Europe Foundation (ASEF) will be at the Performing Arts Market in Seoul (PAMS) from 7 to 12 October 2018. We have received a total of 253 applications for the 2nd cycle of Mobility First!, the Asia-Europe Foundation (ASEF)'s travel grant for artists and cultural professionals. Press Release - Mobility First! We have received 298 applications for the 1st cycle of Mobility First!, the Asia-Europe Foundation (ASEF)'s travel grant for artists & cultural professionals. 2018 marks the second year of Mobility First! - the Asia-Europe Foundation (ASEF)'s travel grant for arts practitioners in Asia and Europe. In this year's edition, Mr Ferdinand RICHARD and Mr TAY Tong are joining ASEF in making the selection of artists, cultural professionals & arts organisations that will be supported by the fund. Ferdinand RICHARD is the founder/director of the AMI Association in Marseille (since 1985), a multi-sectoral cultural development platform with a consistent international cooperation programme. He is also co-founder of La Friche Belle-de-Mai (since 1992) and has been Deputy Director for the past 8 years under architect Jean Nouvel. Ferdinand is concurrently the President of the Roberto Cimetta Fund (since 2009), an international non-profit organisation that funds the mobility of artists & cultural professionals in Europe and neighbouring regions. Ferdinand is a member of governance of the Institut du Monde Arabe in the Hauts-de-France Region (since 2016). He is also the Founder-President of Global Grand Central, a global internet platform for artists and cultural projects, archives, and narratives (since 2017). In addition, Ferdinand is a board member of the Observatoire des Politiques Culturelles-France (since 2002), as well as President of The European Forum for the Arts and Heritage (re-named today Culture Action Europe). Further, he is a collaborator/expert for Agenda 21 for Culture (United Cities and Local Governments) since 2006. He is also a premier coordinator and expert of the International Fund for Cultural Diversity/UNESCO experts panel (2006-2015). Ferdinand was also a musician and producer (1971-2000). TAY Tong was the Managing Director of TheatreWorks (Singapore) and its space, 72-13, a conservation building, for a total of 20 years. Tay has 30 years of professional experience. He joined the company in 1989 as its Production Manager and was appointed the Managing Director in 1999 after he completed his MA at Goldsmiths College, University of London. In the same year, he was also appointed as Director, Arts Network Asia (ANA). From June 2013 till November 2017, Tay was concurrently the Aide to the Festival Director of the Singapore International Festival of Arts (SIFA). Tay was the Director of Arts Network Asia (ANA). Through the 18-year-old ANA, Tay brokered greater intra-Asia dialogues and exchanges. ANA provides project grants and mobility grants to artists and cultural workers to develop connectivity and a network of dialogues within Asia. Between 2012 - 2016, this network has expanded to include Europe with the Creative Encounters Programme, a partnership between ANA and the Asia-Europe Foundation (ASEF). Tay is an advocate for engagement with diverse cultures and supports the philosophy of ‘celebrating differences’ and cultural negotiation. And this forms the pillar to two key inter-cultural, multi-disciplinary and capacity building programmes in South East Asia. Tay produced the biennial Flying Circus Project or FCP, a process-based multi-disciplinary, long-term research and development programme in theatre, dance, music, visual arts, film and ritual, since its inception in 1996. From 2007 to 2013, other than in Singapore, the FCP has been sited in Vietnam, Cambodia and most recently in 2013, in Myanmar. This required Tay to work on the ground in-situ over a two-year period before the FCP descended on the country. Between 2002 and 2012, Tay also managed a capacity building programme, The Continuum Asia Project in Luang Prabang, Laos, working with elders and youth there to explore a sustainable developmental intervention through Asian heritage and traditional arts. Through this programme, Tay has assisted in the revival of the Laotian traditional form, Pharak Phalam which is the Laotian version of the Ramayana. At the same time, he has managed programmes to enrich the perception and arts exposure of youth in Luang Prabang; while imparting administrative and management skills to the Royal Ballet Theatre of Luang Prabang. For the past three years, Tay is an adjunct fellow at the Singapore Management University. He conducts a 15-week Arts Leadership programme each year, to encourage creative thinking and practice among arts management, business and law undergraduates at the University. His accolades include being the first and only arts manager to date, to be awarded the Japanese Chamber of Commerce & Industry’s Culture Award, in 1996, in recognition for his contribution to the arts in Singapore. Tay also sits on various advisory panels in Singapore and internationally. He, too, was on the 2017 nominating panel for the Bellagio Residency by the Rockefeller Foundation. Anupama SEKHAR's and Fatima AVILA's profiles can be read here. 1st Cycle Results - Mobility First! 2nd Cycle Results - Mobility First! 3rd Cycle Results - Mobility First!